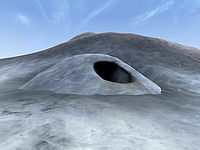 Frykte is a small ice cave located east of Castle Karstaag. It contains many skeletons, dead and undead. 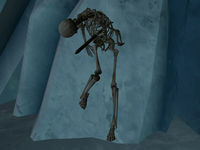 Stuck to the roof of a room is the skeleton of Angria, holding an Ancient Steel Helm, part of the Snow Prince's Armor, which is said to have been looted from Jolgeirr Barrow. There are a few chests containing minor items. Lying on the ground there is also a unique short blade called Wolfender Silver Dagger. "Frykte" is Norwegian for 'to fear'. This page was last modified on 5 March 2019, at 11:02.